Seven miles into the Paris Marathon I was content, blissfully lost in the illustrious City of Light. But then I saw the pacesetter and I was hooked. So fanatically attached to the mythical four-hour mark, I missed it all. Focused on the clock, I missed Paris. Well, almost. The day before the Paris Marathon, I visited the running expo in a gigantic convention center. Strolling from vendor to vendor, I stopped at a poster the race organizers had created for the almost 40,000 participants. Alphabetized and running horizontally on the massive poster were the names of every runner. Laid over the names was the marathon route through Paris, a thick white line that happened to obscure an unlucky few. I watched as participants pointed gleefully at their names, making peace signs or a thumbs-up for cameras. Some growled as the great white route bulldozed through a letter in their name. My name was nowhere to be found. It was completely obscured by the route. 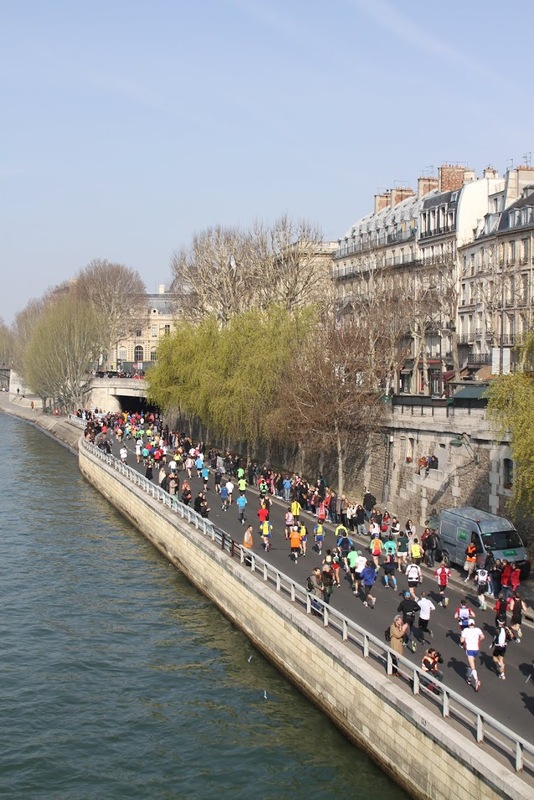 In the Marathon de Paris runners must show their race bibs to a volunteer before they can squeeze through a narrow opening in a ten-foot-high fence to join the other 39,967 participants. After you cross the threshold, you become a kind of wild park animal for friends, family and spectators dangling from windows and sipping espressos in cafes. The pictures that day have the unfortunate familiarity of a zoo. Me, hopping in place, making goofy faces and tongues at the camera. It was Sunday, a little after 8:00 a.m. 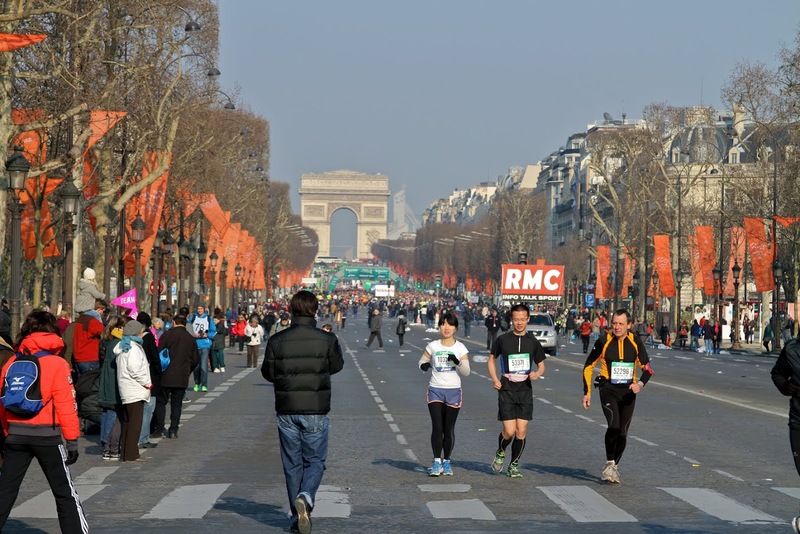 I emerged from the Metro, stepped onto the Avenue des Champs-Élysées and gazed up at the Arc de Triomphe, where the 26.2-mile race began and ended. There was a palpable buzz in the air for the fifth-largest marathon in the world, a whirling electricity of nerves and exhilaration. I felt bad for any shop owner with a toilet. Runners bunched up in droves outside bathroom doors, staring at the floor, tapping their feet as Nature called. “Sir?” a waiter asked me, raising his finger as I darted through the front door of a café. But I was already halfway down the steps, shamed a bit. I joined the long line for the bathroom, and smiled each time a flush rang out. Turns out the bladder wasn’t equipped to stow two coffees, a full Gatorade and who knows how many anxious gulps of bottled water. As I slipped through the gate, I joined runners bunched into different start zones grouped by self-predicted finish times. I had chosen the 4 hour, 30 minute zone based on my two previous marathons where I had run 4:10 and 3:55. It was a respectable category, I thought, one that conformed to my original plan of just taking the whole thing easy. It was April and the morning air was frigid. I watched people bounce in place and blow into cupped fingers. Some folded their legs in half, stretching. Others crossed their arms and studied the pavement. Doubled-up on fleeces I rubbed my hands together vigorously. Looking around, I felt like I had attended a Halloween party without a costume. A young man next to me wore a pink bunny suit. The man in front of him had donned a Superman costume. There was a group of girls dressed as cocktail waitresses and a group of guys in full banana suits. I saw a woman in a business suit and a man in wig; even someone wearing a 6-foot-high Eiffel Tower. To pump us up, a spirited race volunteer stood atop a metal crate and shouted encouraging words through a loudspeaker, none of which I could understand because it was in French. Clapping and dancing to blaring techno music, she managed to synchronize hundreds into a jumping jacks routine and then a kind of collective jive, perhaps the largest flash dance in history. Minutes later, I heard the gun fire, but I didn’t move. I couldn’t. There were literally thousands of people bunched up in front of me. I had to wait almost 30 minutes before the waves cleared out. As I crossed the start line with fellow runners shouting and holding their hands high, I witnessed the marvelous city in glorious fashion. Ten minutes into the race I found a rhythm, happy to be warm. I took a sip of water and scampered down a hill, rubbing shoulders with runners. I circled the obelisk in the Place de Concorde then turned onto Rue de Rivoli. The Champs-Elysees opened up into five or six lanes and people began to create cushions of space. The course was flat, never higher than 200 feet and fairly straightforward. Seven miles in, I passed through the Bois de Vincennes. I was strangely okay with the fact that I still had to jog more miles than most people’s daily commutes. The route took us by countless fountains, manicured trees, cinemas, gardens, museums, galleries and cafe after cafe. Half the fun was admiring the creativity of the spectators hugging the road. According to the race website, there were between 200,000 and 240,000 spectators present for the city-wide party. While running, I locked eyes with a 70-year-old woman in a red and white costume. She was stomping her feet and somehow fashioning a melody with two wooden dowels. I smiled then ate an energy gel, losing myself in the musical acts and stunning architecture, the shouting crowds and the huffing and puffing of racers. Like river logs nearing a smaller stream, the course narrowed and funneled us into a tunnel — one of many. The sun ducked away as I entered and came shoulder-to-shoulder with strangers, so close I could practically smell the mashed banana on the soles of their shoes. Separating us briefly from the spectators, the tunnel provided a profound camaraderie, a visceral we-are-in-this-together bond between those crazy enough to run the race. I turned off my music and heard heavy breathing echo off the brick walls then mix with the slapping of hundreds of pairs of sneakers meeting the cobblestone street. In the middle of the tunnel someone let out a war cry. Another joined in, and then everyone was cheering triumphantly. I was just glad to be there. And then it happened. Something awful. I saw her. She wasn’t hard to pick out of the crowd. People huddled around her like mothers clutching infants in hopes of getting a kiss from the Pope. She was the pacesetter — a trim, perfectly athletic girl with a pole attached to her back. At the top of the pole was a flag maybe six feet above her that said, “4:00 hr.” I made the decision to pass her, and stay past her. For my second marathon in Newport, Rhode Island, three years ago, I had somehow run a 3:55. I’m a rugged fellow and built for power, so I’ve always been into contact sports — football in high school, rugby in college. Beating the mythical 4-hour mark in Newport was a sheer display of willpower. I remember planning to “enjoy” that race also. That was until I asked an impossibly fit older man the time. “I’m on pace to break four hours,” he had said, looking at his watch. “Follow me and you will, too.” I did. And I broke four hours. I even remember tearing up as I neared the finish line, in awe that my legs hadn’t become traitorous and folded as I desperately tried to hit some “target time” for which my body had no interest. 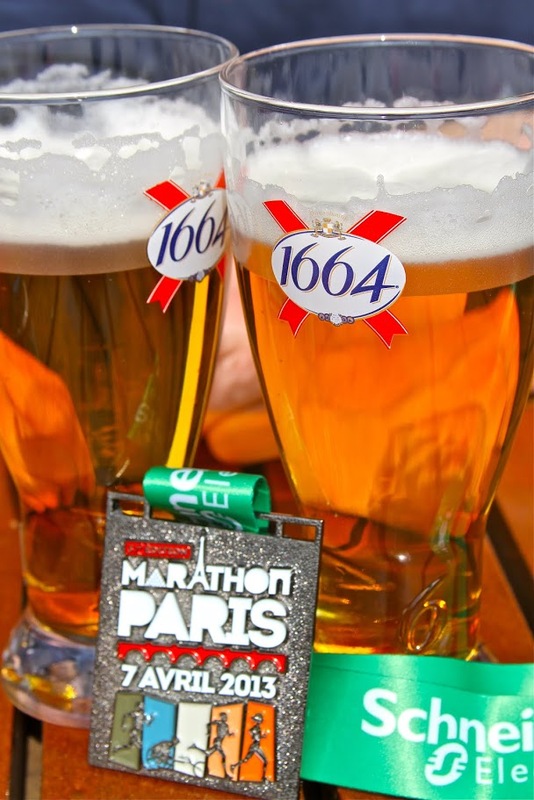 My plan with the Paris marathon was to enjoy it, but I have a pattern for flip-flopping mid-race. As I accelerated past the pacesetter, I decided to beat the four-hour mark again; maybe set a personal best. I adopted a Spartan concentration and mumbled some platitude like, “Pain is weakness leaving the body.” I gained five, maybe ten minutes on the pacesetter and my focus intensified. But as I fantasized about the goal, Paris’s beauty slipped away. Everything slid to the periphery, subservient to the purpose, the 4-hour mark. In a place you could spend a lifetime wandering charming streets, I was too absorbed to notice any of its gifts, off in a dream. I was absent, essentially. I also started to undervalue accomplishments like passing the half-marathon mark. As I reached this milestone in the heart of Paris, I said, “13 more to go,” and dug in. I heard spectators shout my name because it was written on the race bib, but their voices were far away. I gave a child a high five, but the boy might as well have been a mannequin. I even ignored the Eiffel Tower as it came into view. No longer was the engineering masterpiece an iconic symbol, but rather a momentary pause from ruminations of steamrolling across the finish line better, faster, stronger. Every 3.1 miles (5 kms) were refueling stations. Like the tunnels, they created their own bottlenecks. As I neared a station around the 15-mile mark I was overcome with conflicting desires. On the one hand, there was the primal urge to satisfy depleted sugar demands. But there was also the compulsion to waste no time. These opposing forces, when multiplied across countless other racers also hooked on achievable time goals, creates an unbelievable carnage, much like what you’d see if a fisherman accidentally knocked a bucket of chum into a patch of ocean infested with sharks. I took an elbow in the side as an ambitious twenty-something cut and shoved his way to the start of the table dispensing food. He grabbed a handful of raisins and smashed them into his face without any sort of accuracy. To avoid much of the mayhem all one would have to do is stop at the table further down the line where it’s less populated with wild runners. But we didn’t. We were on schedule. On pace. I fell in behind the raisin bandit and snagged two bananas. I bit into an orange slice and ducked out of the chaos. As I left the station I watched runners toss plastic cups aside, almost never hitting one of the many trashcans. It was around mile 17 or 18 when the pacesetter caught up to me. I tried to speed up, but I seized like an engine caught in second gear. My legs were shot, presumably from pushing too hard too fast. Eventually she got away from me and I watched the 4-hour flag bob out of sight. It was then that I made my second game-time decision. I let it go. I detached myself from the pacesetter and the racers around me, and, suddenly, the city of Paris came back into focus. With over 90 musical groups on the streets, I heard music from the full orchestras to lone drummer boys; from hooligans blowing horns to slick street musicians strumming violas. And there were some characters, too, practically from a Dr. Seuss poem. There were women in blue wigs, gripping white pom-poms. Soldiers in black uniforms and high white socks. A man dressed as a butler, sipping champagne from a thin glass. Streaming from a wire across the road were 112 flags, representing all the participating countries. There were dance groups and rock bands and somehow the performances helped with the misery of it all, a shift of attention from cramping legs. I came to another refueling station, but this time it was different. I avoided the madness at the front of the line and squeezed in at the end, non-threateningly. I saw a man cramping, so I gave him a sodium tablet and wished him good luck. I probably wouldn’t have done that with a time goal. His pain would have been invisible. At the end of a marathon there’s no big climax, really. By definition, it’s almost anti-climactic. 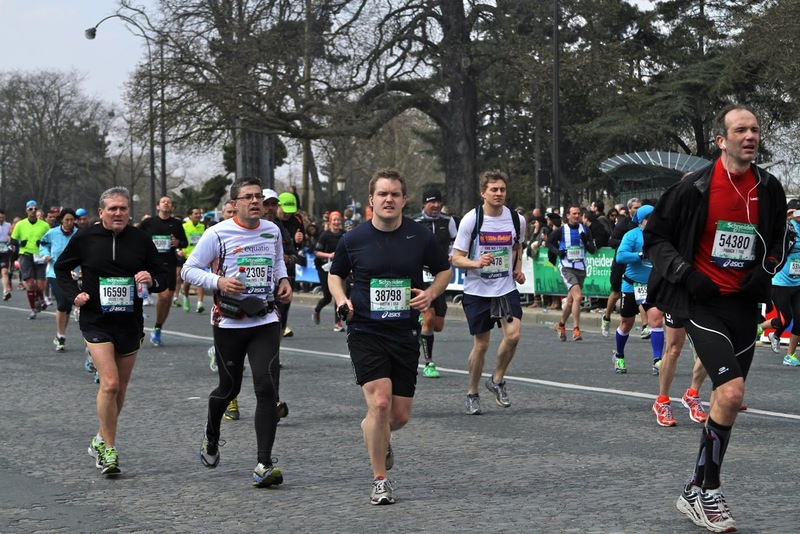 The last few hundred feet of the Paris marathon came down the Avenue Foch. I had hoped for the end, begged and bargained, and hoped some more. But when it came, it just came. As I crossed the finish line I took a mighty breath and nodded to myself slowly. Others crossed with their own triumphant gestures: a fist to the sky, a single finger overhead. Though there were infinite variations to demonstrate personal glory, there was one shared sentiment: relief. Though limping, my body was pleased not be called upon anymore, not just physiologically, but emotionally. The mind, I think, experiences the most relief, no longer subjected to extreme fixation. This relief is a spiritual one. It’s maybe why that glass of beer following such a feat is the “best beer you have ever tasted.” Because your mind is so exhausted it can’t fixate on anything but that beer. It’s too tired to run away, pleasantly captive to the present moment. Months after the race, I learned that the refueling stations throughout the marathon had actually served cider, beer and wine, and even oysters. The race organizers had even set up a tent at the finish line for foot massages facing the Eiffel Tower. I hadn’t even noticed. Dustin Grinnell enjoys all things extreme, welcomes misadventures and greatly enjoys taking the contrary position in conversation. His travel pieces and essays have appeared in such publications as Verge Magazine and Narratively. He is the author of the science fiction thriller The Genius Dilemma, and has written a feature-length screenplay. He is currently a science writer for a biomedical research institute in Cambridge, Massachusetts.